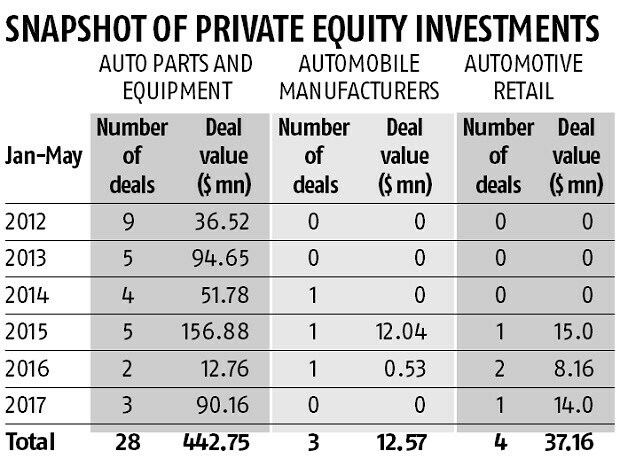 Private equity investment in the automobile component sector rose 607 per cent to $90.2 million in the first five months of this calendar year, over the same period last year. Merger and acquisition (M&A) deals in the sector were up 170 per cent to $254.8 million. According to VCCEdge data, three deals alone attracted around $90 mn this year. These included Piramal Finance's investment of $42.5 million in RSB Transmissions India and $44.9 million in IndoShell Mould. SAIF Partners India invested around $2.8 million in Fiem Industries. Khushru Jijina, managing director at Piramal Finance, said: "The auto components space has been on our radar as a focus area for a while." The industry has grown at a 15 per cent compounded annual rate over the past decade, significantly higher than the original equipment makers themselves. Both RSB and IndoShell have long-standing relationships with major OEMs. 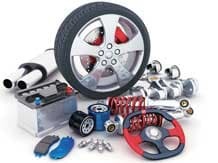 Sector experts say the components industry is projected to clock $50 billion in revenue by 2018-19, up from $39 billion in 2016-17. "We look forward to more such transactions as we further scale up our investment focus towards this sector," said Jijina. The automotive retail space has attracted one investment so far this year. Banyan Tree Growth Capital invested $14 million in Popular Vehicles and Services. In the M&A space, there have been 11 deals worth $245.8 mn so far this year, against $94.4 mn across seven deals in the comparable period a year before. These include JTEKT Corporation's $125.3 million acquisition of a 51.12 per cent stake in Sona Koya Steering in February and a $66.1 million investment for a 34.04 per cent stake in Agile Electric Sub Assembly, for which the investor is not known. The only outbound M&A was Hi-Tech Gears' $43.7 million investment for the entire equity of Teutech Industries. Peugeot SA has invested $11.95 million in Hindustan Motors' Ambassador brand for 100 per cent stake. There was a $5 million investment by Meidoh Co in Sterling Tools. The automotive retail sector saw two M&A deals but no value was disclosed. These were Smarton India's investment in Volta Motors and SAIC Motor HK Investment's for 100 per cent stake in General Motors India's Halol unit.